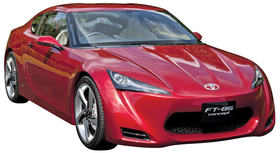 The FT-86 is a joint project with Subaru. GOTEMBA, Japan -- Toyota's top executives can barely open their mouths these days without rhapsodizing about the company's new push to produce "fun to drive" cars. The orders come straight from Akio Toyoda, the car-crazy president who has made it his mission to overhaul Toyota Motor Corp.'s reputation for bland and boring vehicles. The strategy is showcased by the Lexus LFA, the $375,000 halo sports car. But zippier intentions are creeping into more accessible products, including the latest Scion tC and the long-awaited FT-86 sporty coupe that Toyota will produce jointly with Subaru. Toyota, which once had a respectable lineup of sporty cars that included the MR2 and Supra, mothballed such projects because of financial constraints, staff limitations and the distraction of managing its global expansion over the past several years, Takeshi Uchiyamada, executive vice president for r&d, said during a recent event at Fuji Speedway, the Toyota-owned F1 circuit. "With the rise of globalization, the number of projects increased faster than our manpower," he said. "Therefore, we had to give priority to advanced projects that might have bigger future potential, and sports cars didn't seem to fit this priority." But times have changed. Toyota is poised to post a second year of operating profits after reporting its first loss in seven decades. And spicing up the brand's image is paramount as it seeks ways to differentiate itself from new rivals such as Hyundai that can match it on quality and reliability, while arguably beating Toyota on styling and price. Still, the initiative may also be bumping up against the latest drive to cut costs. And while Toyoda and his lieutenants use every public speaking engagement to pitch their fun-to-drive message, it remains to be seen how this will translate into more inspiring products. Toyota's return to mass-market sporty cars was announced in 2007, when it lifted the veil on plans for the Subaru joint venture. But that car, which Toyota bills as the spiritual successor to the AE86, known as the Corolla GT-S in the United States, wasn't exactly fast-tracked. It won't arrive until 2012. That leaves a six-year gap in sporty product since Toyota retired the Celica in 2006. The Supra had been on the roads for nearly a quarter of a century, from 1978 to 2002. Meanwhile, the Lexus brand is a focal point of Toyota's quest for dynamism. The LFA sets the tone. But offerings like the recently introduced Lexus HS 250h hybrid, a reskinned version of the dowdy Japan-market Toyota Sai hybrid sedan, fall short in performance. Kiyotaka Ise, managing officer in charge of Lexus development, acknowledges the need for new priorities: "Up until now, Lexus has been about calm, stable luxury. From now on it will be more about agility and response, really feeling the braking and acceleration." Tweaking powertrains and suspensions will play a role in the overhaul, he says. The $375,000 Lexus LFA is the halo car for the new more-fun strategy. In any case, Toyota argues that fun-to-drive is more than supercharged engines and double-wishbone suspensions. In the company's internal parlance, it is just as much about style. Even if the car's the same under the hood, Toyota wants drivers to feel hipper behind the wheel. That was the message on the redesigned Scion tC launched in August. Its new engine churns out 180 hp, 19 more than its predecessor. It also got bigger brakes and a lower and wider ride for better handling. Toyota also sport-tuned the exhaust to give it a throatier sound. Angular styling trades the tC's rounded look for something brand chief Jack Hollis described as more "sinister." Scion hopes the redo will double its sales to at least 35,000 units in 2011. A planned Prius coupe, to compete against Honda's CR-Z sporty hybrid, echoes the trend. Global design chief Simon Humphries says styling is key to the fun-to-drive shift. He wants to inject attitude through more expressive, dynamic front ends and through more options for personalization of colors and material by customers. "Sometimes everything doesn't have to be so uptight. It can be relaxed," he says. Scion's redesigned tC got more power, better handling. 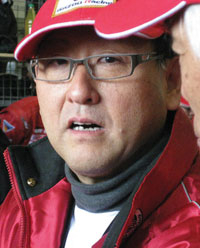 Perhaps the biggest sign of change is President Toyoda's creation of a Sports Vehicle Management Division last January. The unit, led by Senior Managing Director Tadashi Yamashina, who also heads Toyota's racing teams, has 50 staffers and aims to bolster sports-vehicle product planning and custom-car planning. "In the past, Toyota had too many committees deciding things; there was no efficiency," Uchiyamada said. "The Sports Vehicle Management Division can be seen as an experiment in changing that -- to make decisions promptly and give employees personal responsibility." Some outsiders, including Dany Bahar, CEO of Group Lotus PLC, say they see a shift in thinking at Toyota. The sports-car maker sources all its engines and transmissions from Toyota. "Toyota was struggling a little bit to get the sportiness, the dynamics," Bahar said during a recent visit to Tokyo. "But they have caught up. The new products that I know are in the pipeline all try to get this ride and handling down properly, with more emotion, more passion." The turning point, according to Bahar, was Toyoda's appointment as president last year. Toyoda, grandson of the company's founder, concedes that he obsesses about styling and the driving experience because he lacks the engineering pedigree of his top executives. For a new CEO looking for a fresh message, it is little surprise he has latched onto "fun to drive." It is one topic he can talk about with expertise and comfort. And as the company struggles to regain its footing after recalling more than 13 million vehicles worldwide in the past year, it is undoubtedly a way to spin the corporate message to something more forward-looking. But whether this is smoke and mirrors or reality -- the proof will be in the product.